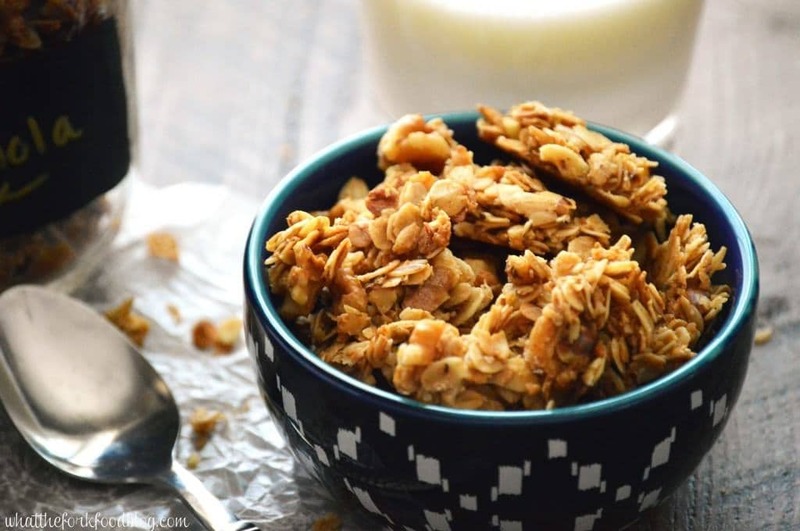 Maple Walnut Granola makes a great snack or breakfast. Enjoy it with milk as a cereal or on its own. 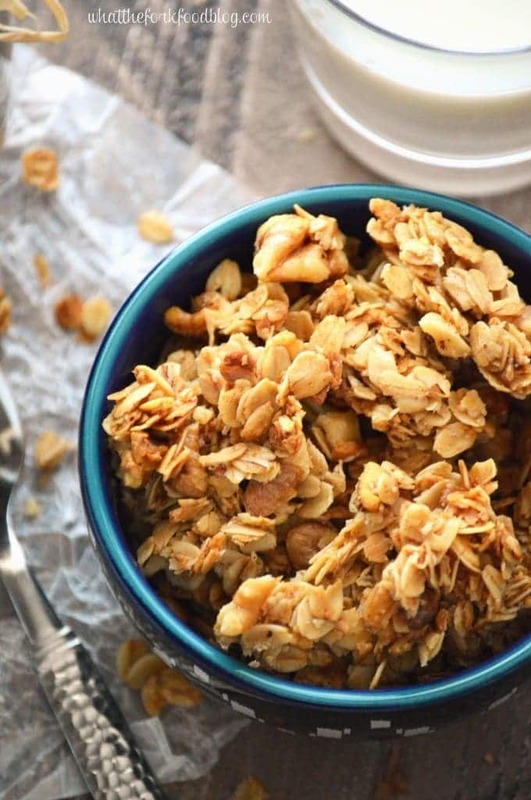 Homemade granola is so easy to make, you’ll never go back to store-bought. My family loves this maple walnut granola. I’ve made 3 batches of this in the last few weeks. 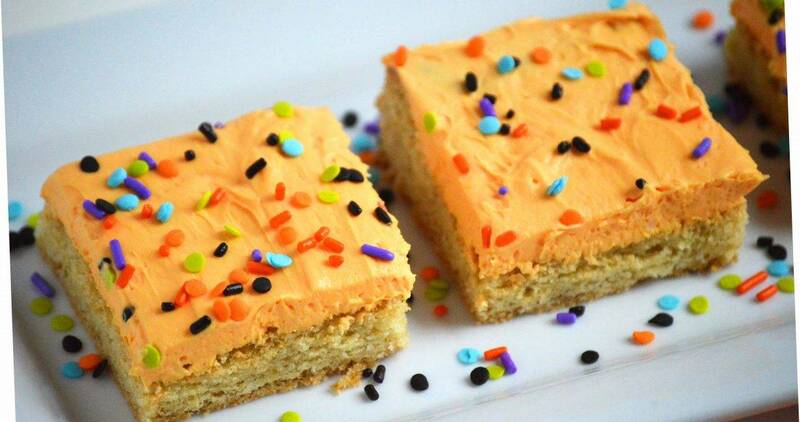 It’s perfect for snacking on and it’s also great for breakfast. 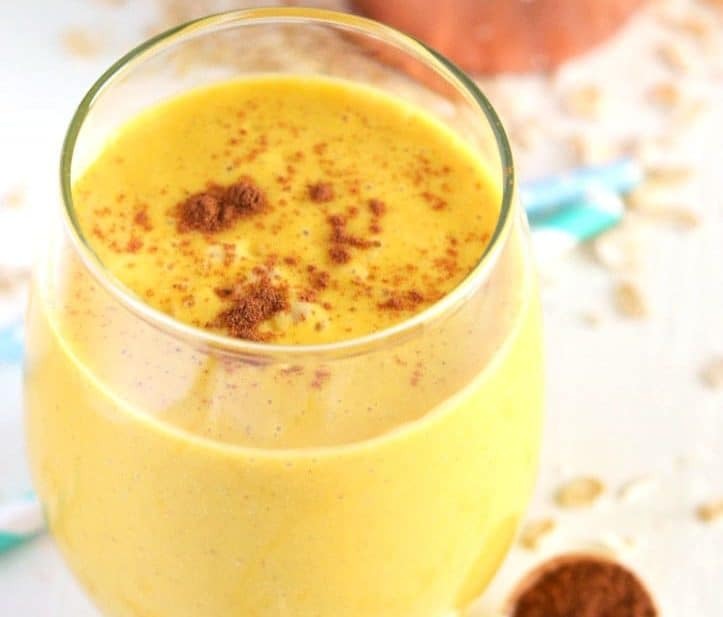 I love eating it like cereal with some fruit on top – so good! Adam and Kelsey prefer eating it dry and snacking on it. Either way, it’s awesome. The first time I made this granola, it was the first time I’d ever made it from scratch. And I’m never turning back to store-bought. The great thing about homemade granola is that you can completely customize it to your taste. It’s also super easy to make. If I knew how easy it was to make granola, I would have been making it years ago. In other news, I’m currently watching SNL’s 40th anniversary – so funny! So I don’t have too much more about this granola since I’m pretty much too busy laughing to be able to form anything coherent. So I’ll leave you with this: This maple walnut granola is waaaay better than “Colon Blow”. Enjoy! Preheat oven to 300 degrees and line a baking sheet with parchment paper or a silicon mat. In a large bowl, stir together the oats and walnuts and set aside. In a small bowl, combine the melted coconut oil, maple syrup, honey, salt and vanilla extract. Mix well and pour over the oats. Stir the oat mixture well until all the oats are coated with the wet ingredients. Spread the oats out on the prepared baking sheet and smooth out until you have an even layer. 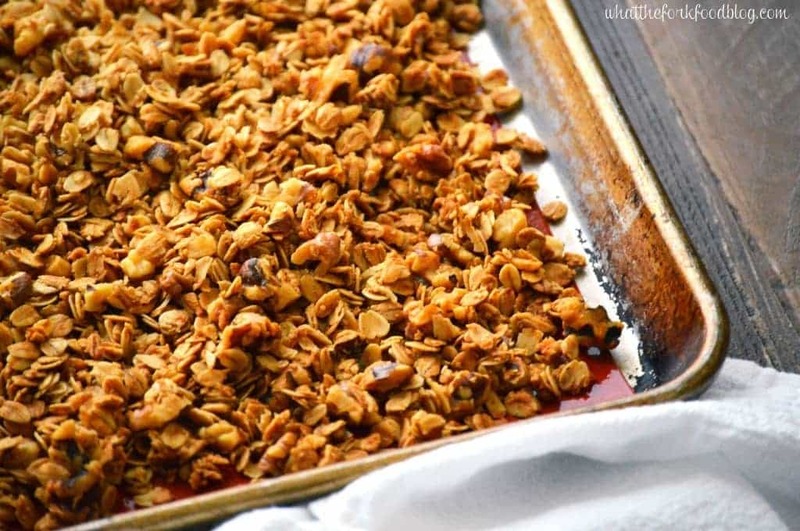 Bake the granola at 300 degrees for 25 minutes. The oats will not be crispy yet but will crisp up as they cool. Cool the granola completely on the baking sheet. Once cooled, break the granola up into pieces. Store in an air-tight container up to 3 weeks. This granola is great for snacking or as a cereal. It also makes a great homemade gift! This post is linked to Inspiration Monday, Made by You Monday, Two Cup Tuesday, Totally Talented Tuesdays, Create Link Inspire, You’re Gonna Love It Tuesday, The SITS Girls, Create & Share DIY and Recipe Party, Gluten-Free Wednesdays, What’s Cookin’ Wednesday, Allergy Free Wednesday, Wine’d Down Wednesday, Full Plate Thursday, Showcase Your Talent Thursday, Create it Thursday, Crafty and Delicious Party, Your Turn To Shine, Pin Junkie Pin Party, Gluten-Free Fridays, Link Party Palooza, Kitchen Fun and Crafty Friday, Savoring Saturdays, Saturday Night Fever, Weekend Wind-Down, Weekend Potluck and Best of the Weekend. My hubster is ALL about granola…but, confession, I always buy it! Homemade granola is da bomb! I like to eat my granola with kefir, and no one else in the family likes it so it’s all for me! 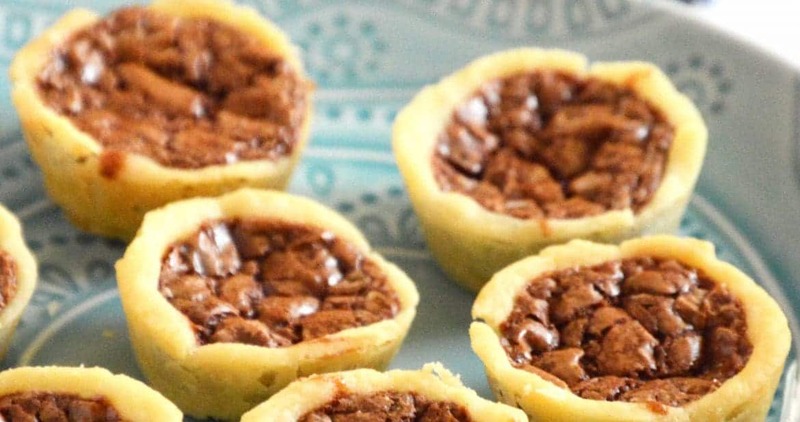 This looks delicious–I’m sure the maple walnut combo is a terrific one. I’m with you. After I made my first batch of homemade, I couldn’t buy it from the store any more! I simply don’t make enough of my own granola. I love the look and sound of this dish and I want to scoop a big spoonful overtop my morning yogurt. Evidenced by my blog, I am a HUGE granola lover! I never buy store-bought anymore! Making your own is just to much fun and delicious! 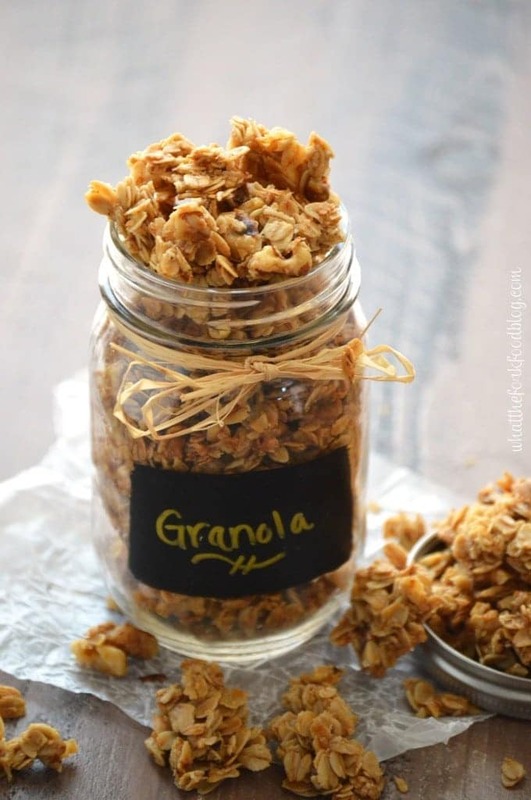 I love granola and have the itch to make some today. I think this is a sign I need to make your recipe! This looks amazing! 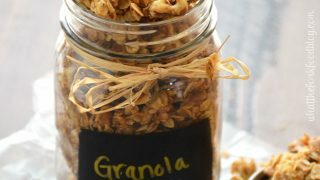 Love the little clusters of granola too, I need to make this! 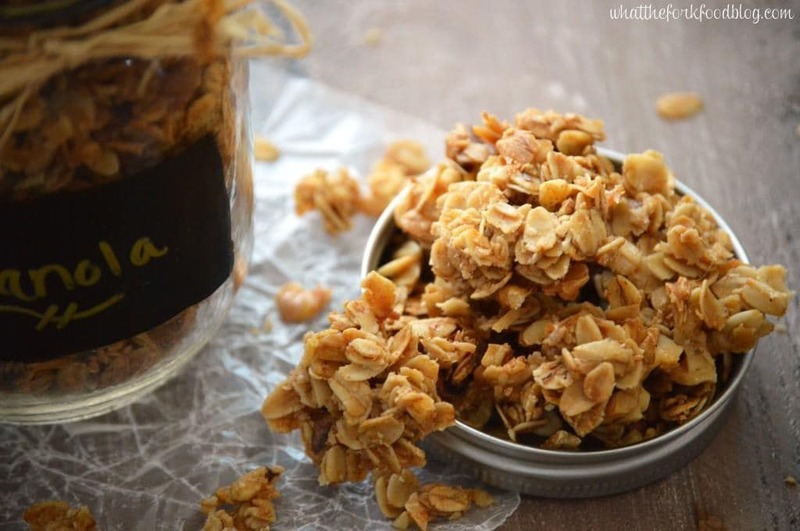 I am such a sucker for granola…I love any kind and yours seems delicious and simple to make. I need to get my granola baking going on soon! Obsessed with granola. I just made a white chocolate macadamia granola and ate all the white chocolate and macadamia out of it. Oops. Maple + Walnut = epic combination. Um, white chocolate macadamia sounds amazing! I would eat all the white chocolate and macadamia nuts out too. Who could resist?! I’m a granola lover, too. In fact I have another that will be going up on my blog this week. I cannot get enough of it, though I buy it as often as I make it. What a wonderful granola recipe, Sharon! What else have you made with it? Thanks Morri! I recently made a parfait with it that I’ll be posting on Food Fanatic. I have never made my own granola, and I really have no good excuse as to why. I always buy it. *Hides from Food Blogger Police* I love how simple this looks. Pinned! lol I’m very new to making it, I always used to buy it too. Sharon, It looks delicious and I love the maple-walnut flavor combo. This granola recipe looks great!! I would love for you to share them On My 2 Favorite Things on Thursday – Link Party, it’s going on now!! I would love to have you!! hi Sharon do you use rolled oats in this recipe? I use the Bob’s Red Mill Gluten Free Old Fashioned Rolled Oats. Thanks for sharing this at Gluten Free Wednesdays, this looks great and I love your ingredients!!! So simple and delicious! Why have I not made granola for so long? We go through so much store bought granola, I have got to make some of this! Sounds delicious, Sharon! 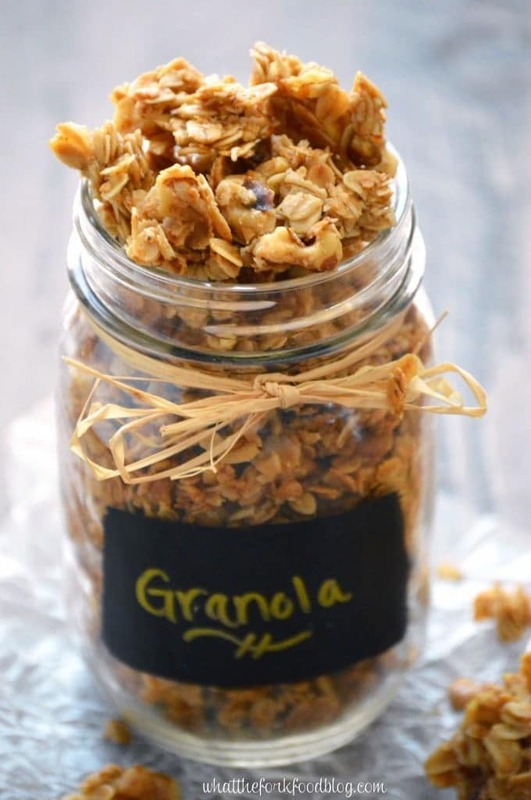 We are huge granola fans around here, so I’m going to be pinning this to try later, for sure! Thanks so much for sharing it with us at Savoring Saturdays! This looks wonderful and I’m going to be giving this a try this week. Thanks for the recipe. hi i cant have honey will it be ok to leave out or is is necessary? I would sub in more maple syrup or brown sugar. Do you happen to know how long it keeps after you make it? Hi Michele – If kept in an airtight container (like a mason jar) it will keep for about 2 weeks. Made this last night and it’s fabulous. I’m on weight watchers so I made it ww friendly by using sugar free maple syrup and only half the oil. Next time I’ll use no oil, no honey, half almonds for the nuts to make it only 2 Smart Points per serving. Thanks for the great recipe!